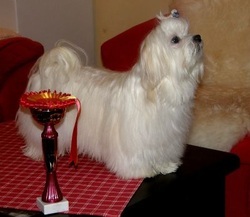 Maltese from Sweden, Finland and America. the breed good. Excellent coat. Lovely temperament. Moves well." "Excellent size and type, excellent proportions. Very beautiful head and expression. Lovely pigment. Sound anatomy. All the details which belongs to the breed good. Excellent coat. Lovely temperament. Moves well."